Kansas doesn't have a minimum age for candidates for governor. camera (Christopher Smith/AFP/Getty Images) Jack Bergeson, 16, of Wichita, Kansas speaks during a forum with some of the four teenage candidates for Kansas Governor at Free State High School in Lawrence, Kansas, Oct. 19, 2017, joined by Ethan Randleas, 17, of Wichita,and Jack's running mate Lt. Gov. Candidate Alexander Cline(C), 17, of Wichita. The state of Kansas has no age restrictions for gubernatorial candidates. The mid-term election will be held on November 6, 2018. Aaron Coleman is just 17 but he has big ambitions. The Kansas teen is running for governor -- and he's not the only one. At least six teenagers have submitted paperwork to run in the November election for governor of Kansas, which has no age restrictions for candidates seeking the state's highest office. Coleman said he hopes his candidacy will inspire more young people to become active in politics to work on issues that affect them. The teen, who is running as an independent, said he is politically progressive and wants to focus on goals such as to raise the minimum wage, make Medicare universal, and legalize marijuana. Ethan Randleas is also a teen seeking to be governor, though with different political aims than Coleman. An 18-year-old senior at a Wichita high school, Radleas was 17 in September when he decided to run because he thinks his political party, the Libertarian Party, is not represented well in the state. Randleas wants to “shrink the power of the government” in Kansas, lower taxes and reform the criminal justice system. Four other teens have also filed paperwork with the Kansas Governmental Ethics Commission for the gubernatorial election. To stay in the race, they have to pay a filing fee by June 1. 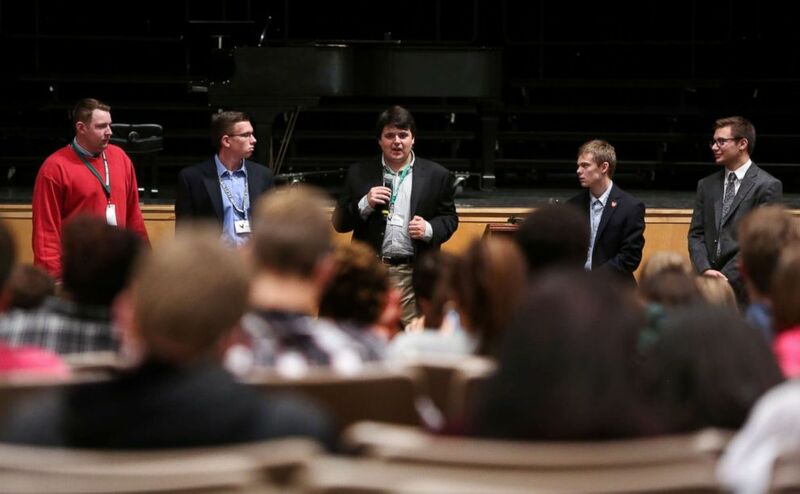 (Christopher Smith/AFP/Getty Images) Jack Bergeson (C), 16, speaks during a forum with the three other teenage candidates Ethan Randleas (L), 17, Jack's running mate Lt. 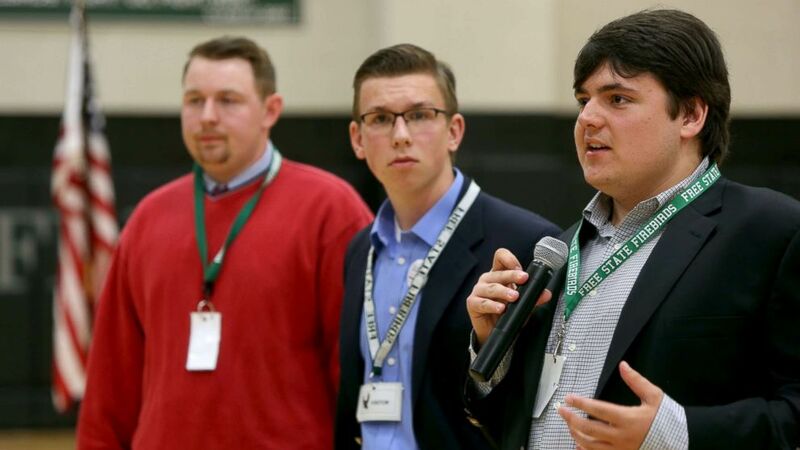 Governor Candidate Alexander Cline, 17, Tyler Ruzich (2ndR), 17, and Dominic Scavuzzo (R), 17, are running for Kansas Governor at Free State High School in Lawrence, Kansas, Oct. 19, 2017. Some Kansas lawmakers meanwhile are trying to set more restrictions on who can run for governor. A bill drafted by state Rep. Blake Carpenter, a Republican, would require that candidates be at least 18 years old and have lived in the state for at least four years. Carpenter said he doesn't necessarily oppose the teens who are running this year. He said he in fact reached out to Randleas to ask for his input on the bill. It was Randleas who suggested the minimum age and residency requirement, he and Carpenter said. Carpenter doesn’t expect his bill to pass this year, but he said he also expects the teens running don't have much of a chance of winning. “We have a new governor," Carpenter said, referring to Republican Jeff Colyer, who took office on Jan. 31 upon the departure of Sam Brownback, who left the governor's office to serve in the Trump administration.